Go to the browser then type vk.com and enter the page. 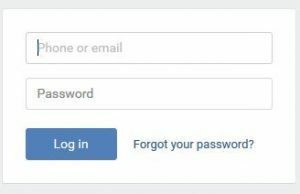 Click on “Forgot your password?” which is on the right side of the page on the right side of “Log in”. It is written in blue color. Then click on “Next” which is in blue color box. Now enter your last name then click on “Next” which is in blue color box. Your profile and name will be shown if the shown name and picture is yours then click on “Yes, this is the profile” which is in blue color box. Click on “Get code” which is in the blue color box. You will receive code on your phone enter the code. Then click on “Confirm” which is in blue box on the bottom of the page. Enter your new password and then again repeat the password. Click on “Send” which is in blue color box. Your account has been reset. Hence these are the steps to reset VK account. This entry was posted in Account Reset Password and tagged change vk.com password, recover vk account, recover vk.com password, Reset vk password, reset vk.com password, vk account password reset on October 31, 2018 by jcgbyHvNvn.